MMD youths have condemned Sports Minister Chishimba Kambwili for his uncivilised and thuggish conduct at the Football match between Nkana Football Club and Etoile du Sahel in the CAF Confederation Cup held on 26th July 2014. MMD youth chairman Howard Kunda says by calling the International Referee Tessema Weseya “very stupid”, Kambwili has demonstrated thuggish behaviour that confirms president Michael Sata’s poor assessment of most Patriotic Front Ministers. ‘Hon. Kambwili should learn the virtue of self-control and realize that being a Minister is a very big responsibility that calls for level-headedness. If he can behave in such a childish manner at a mere football match, what more when he is required to make big decisions that affect millions of Zambians? Considering that Hon. Kambwili’s name has been touted as a possible successor to President Sata, we shudder to think about what the state of Zambia would be after just one year of such tantrums in Plot One,’ Kunda said. ‘Never in the 50-year history of Zambian football has such an unprecedented event ever occurred. Not even under the British colonialists. Hon. Kambwili should realise that his unbecoming behaviour does not show him as a good role model for the youth of this country whom he represents by virtue of his ministerial portfolio,’ Kunda said. The MMD MP for Muchinga constituency said Kabwili was previously removed from Ministry of Foreign Affairs and later Labour. ‘Like many other Patriotic Front Ministers, Hon. Kambwili has demonstrated the low calibre of leadership in the PF’. ‘It therefore comes as no surprise when the PF and other opposition political parties attempt to poach some of our high quality leaders. The MMD has the best leaders who would not behave like this. We are a very disciplined party that can never condone such uncouth public displays,’ he said. But Kambwili has refused ever insulting the referee. t Ministers, Hon. Kambwili has demonstrated the low calibre of leadership in the PF’. 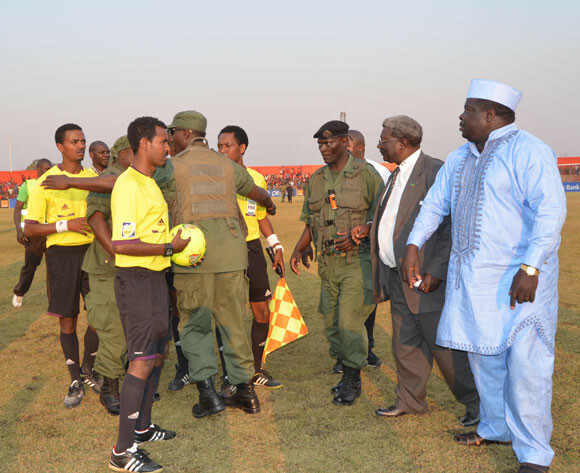 But on Sunday morning, Kambwili denied ever insulting the Ethiopian born referee and held a press briefing in Luanshya issuing a 48 hour ultimatum to journalists that covered the match failure to which he will take legal action. Kambwili said at no point did he call the Ethiopian referee stupid. The Sports Minister has also threatened to sue Abigail Chaponda (The Post) and Kalumiana Kalumiana (freelancer) in their individual capacity for articles related to his behaviour after the match. “I am extremely disappointed with this kind of reporting, some reporters want to destroy me but I can tell you that am clean because what has been reported is excellent lie, you can even ask the ref he would be shocked to hear that I said he is stupid,” Kambwili said. He said he will write to CAF and FIFA to get a video and review the game which he said was poorly officiated.